U.S. Senate Candidate, Beto O’Rourke speaks at Kiwanis Park, Wichita Falls. School spirit on campus OUR VIEW: While there will always be events that are more popular than others, we feel there should be more school spirit during homecoming. rom the Torchlight Parade to the Saturday night football game, homecoming is a time for students, alumni, and families to take part in the traditions, celebrate school pride and enjoy the activities. This is also a time for families to visit and for alumni to reunite with their graduating class; at least it should be. Events such as the bonfire, Mustangs Madness and lip sync are popular with students, and The Texas State Fair, a new homecoming event made for this year’s theme, ‘Texas sized homecoming’ was also well received. However, we believe there is still room to grow in the school spirit department. Even students that did attend the homecoming events weren’t “hyped”. As we covered each homecoming event we noticed low attendance rates at some and large attendance at others, but very little reaction from the attendees. We believe that homecoming is a time to show your school pride and act outlandish, with no shame; that is what homecoming is about. Organizations are reaching out in efforts to provide a better homecoming experience for students and in the process create school spirit. We believe the overall campus attitude has to change in regards to attending events before any progress will be made in creating spirit, but that depends on the students. ust like everyone else, I spent my time with acquaintances, taking classes, joined clubs and playing sports. As I got older, these ob ligations started to pile up higher than I could reach. Classes got harder, boys got cuter, girls got meaner, and reputations became a priority. So there I was — juggling college classes, a deMia manding relationship, typical drama, and my Heck small-town reputation. Then I moved off to a university where all those things were accompanied with the stress of moving towns, making new friends, joining a sorority and working with The Wichitan staff. I loved them all so much that I was always dedicating too much time, in too many places, for too many people. My favorite activities became mundane, and I lost the feeling of how excited they used to make me feel. My favorite activities and people eventually became obligations. I was an over-active people-pleaser and I was getting exhausted from it. 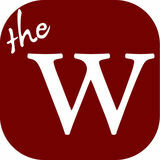 The Wichitan is a member of the Texas Intercollegiate Press Association and the Associated Collegiate Press. The Wichitan reserves the right to edit any material submitted for publication. First copy free. Additional copies 25¢ each. Opinions expressed in The Wichitan do not necessarily reflect those of the students, staff, faculty, administration or Board of Regents of Midwestern State University. The Wichitan welcomes letters of opinion from students, faculty and staff submitted by the Friday before intended publication. Letters should be brief (250 words or fewer) and without abusive language or personal attacks. Letters must be typed and signed by the writer and include a email address, telephone number and address. we definitely support each other,” Cervantes said. Bennett said she studies at the Moffett Library after she gets off of work from Target because the library is a place where her peers can engaged about the same lectures. “My preferred place to study is the library because I can engage with people that are related to my major [respiratory care] which helps out a lot on my assignments. The library is less distracting because there is no television,” Bennett said. Cervantes said despite her schedule and majors are not convenient with Bennett, she will try to participate in a study session with Bennett at the Moffett Library. “Our schedule is opposite of each other, but when we do have a chance to study together she will contact me and be like ‘Hey, I’m at the library. If you have time, you can come to do your assignments with me’ despite our majors are nothing alike,” Cervantes said. Bennett said she is inclusive of any genres when it comes to listening to music while driving from her occupation. “In regards to any genres I listen to, I am across the board. I do not exclude any genres. If there is any particular regular jam, it would be the soundtrack of The Greatest Showman,” Bennett said. For Bennett, she lives with two principles: working hard and living by faith. “I don’t try to speculate about the future a lot,” Bennett said. Kappa Sigma and Sigma Kappa spread their homecoming spirit by using this years theme: Texas State Fair in their float, with Andrew Grisham, general business sophomore, as Big Tex during the Homecoming Parade Oct. 27. Jay Robinson, kinesiology junior, fills his plate during the Fish Fry at Sikes Lake Oct. 26. Keith Lamb, vice president for student affairs, holds a plate and socializes while waiting to grab his fish at the 39th annual Fish Fry Oct. 26. Students feel the heat of bonfire as they watch their T-shirts go up in flames at Nocona Trail south parking lot Oct. 26. | T-shirts and TSU sign go up in flames during the annual homecoming bonfire. Students walk down Comanche with their torches in celebration of the Torchlight Parade for homecoming Oct. 26. Karla Herny, finance senior, blows out her torch during the end of the Torchlight Parade Oct. 26. Pre-physical senior and guard Chelcie Kizart is celebrated for beating the men’s basketball team in the 3-point shooting contest. | MSU Cheer and Maverick welcome Kityana Diaz, radiology sophomore, onto the court. | Crowd cheers for the women’s basketball team for beating the men’s basketball team in a 3-point shooting competition at Mustang Madness Oct. 25.
s part of a continuing series of events with homecoming, the Office of Student Leadership and Involvement presented Mustangs Madness Oct. 25 in the D.L. Ligon Coliseum. The event started off with the cheerleaders coming onto the floor and ramping up the crowd’s spirit for the women’s and men’s basketball teams. The players danced their way through the spirit line while the audience clapped and cheered. Mustang Madness still contained the men’s and women’s 3-point contest, dunking contest and ended with the Whataburger for a year 3-point shot contest and the 500 dollar scholarship giveaway. The event was slightly different from previous years because the lip sync finals were held in between the different sections of Mustang Madness. ing and the general upbeatness of the music. Q.| Why did you decide to attend? A.| I wanted to know the winner of the lip sync battle. Q.|Did the event get you excited for basketball season? A.|Not really, I don’t like sports. Q.| Would you attend an event like this again? A.| Yes! I would go again! Undecided freshman and forward Tayvion Johnson competes in the intersquad dunking contest at Mustang Madness Oct. 25.
Business sophomore and guard Trae Jones competes in the intersquad 3-point contest at Mustang Madness Oct. 25. 8 | Oct. 31, 2018| T H E N E X T FOOTBALL GAM E IS SATURDAY AT WESTERN N E W M E X I C O AT 1 P. M .
Mechanical engineering senior and running back Vincent Johnson gets past Tarleton State University’s defense for a 10-yard gain. After a call against MSU’s offense, the crowd protests in game against Tarleton State University Oct. 27.
gainst rival Tarleton State University, the Mustangs lost 34-35 at the homecoming game in front of a crowd of 9,247 people. Bill Maskill, head football coach, said the loss was disappointing but he was satisfied with the team’s toughness. “The kids are devastated, especially about the way we lost. But they were resilient all game long. We never gave up, we kept battling the whole night. Things didn’t go our way, but our kids kept fighting,” Maskill said. Accounting senior Layton Rabb said if there is one thing they can build upon a successful facet of the game, it would be scoring a touchdown with not a lot of time in regulation. “We showed that we can go on a one-minute drill to score a touchdown,” Rabb said. Exercise physiology senior Alec DiValerio said the loss was tough to experience, but the team will not dwell on the loss. “It’s a sour taste for the next 24 hours, but I feel like the guys know we have to move on and win out if we want to have a chance of making it to the playoffs,” DiValerio said. Maskill said the homecoming traditions did not affect the players’ performances. “We [the football staff] let our kids [football players] go back to their apartments or dorms. They didn’t go to the bonfire. There are enough distractions during the course of the week. Former players and alumnis coming back during homecoming week was a good thing,” Maskill said. Offensive lineman and business management senior A.J. Rolland said the loss is only one result as he wants the team to start focusing on next week’s game. “We’re going to come to work on Monday, go to meetings about football and watch the film to see what we can build upon and what we need to improve on in order to prepare for the next game,” Rolland said. The team has a 6-2 overall record, with a 4-2 record in the Lone Star Conference. After a call against MSU’s offense, head coach Bill Maskill disagrees with the sideline referee in game against Tarleton State University Oct. 27. Mass communication seniors Treston Lacy and Morgan Haire posing as king and queen at the homecoming game against Tarleton at Memorial stadium Oct. 27. Students completing the Cardboard Boat Race at Sikes Lake on Oct. 26. Trevor Snyder, mechanical engineering sophomore, and Brooks Cremer, nursing sophomore, celebrate their victory. | Students representing their organizations try to cross Sikes Lake during the race. | Mario Ramirez, student involvement assistant director, gives the OK to start the Cardboard Boat Race. | Students preparing their boats before the Cardboard Boat Race starts at Sikes Lakes on Oct. 26. Josiah Robbins, kinesiology and mathematics education freshman, holds on for dear life on the bull. | Alexis Rangel, nursing freshman, jumps over the arm on the Meltdown. Constance Caraway, early childhood education sophomore, and Kathy Bone finish the run at the Mustang Stampede 5k and one mile Fun Run Oct. 27. Giavonna Johnson, nursing freshman, falls off the bull at Maverick’s 12th birthday party in CSC Comache Suites and atrium Oct. 24.
made it work and it actually turned out pretty well,” Arriaga said. Keza Muvunyi, mass communication freshman, agreed saying the event it was fun. She attempted to ride the mechanical bull but the ride lasted for a couple seconds. “It was fun, I just got done riding the bull it lasted a couple of seconds but it was fun. [The food] was good, I liked the toast and the cake,” Muvunyi said. Alexis Valenzuela, social work freshman, also enjoyed the event, saying it was fun. She also attempted to successfully ride the mechanical bull but got off as soon as she got on. like doing. “ After finishing the race, Lipscomb walked over to Sikes Lake and ran another eight miles before the award ceremony. Anna Hern, Wichita Falls local and second place overall competitor, said she decided to run in the 5k for exercise. “I just like to run and I like doing the long stuff,” Hern said. “I think running is the absolute best exercise on two feet.” Constance Caraway, sophomore education, heard about the 5k in one of her classes and decided to go with two friends. “I heard there would be breakfast and T-shirts [with registration] so that’s why I wanted to come,” Caraway said. This was Bagley’s first time to do a 5k and she was able to grab first place for her age group. Kristen Longo, art freshman, chose to do the 5k to get involved in the different activities on campus. “Since this is my first semester, I’m trying to do the things the campus has to offer and get involved,” Longo said. “This is my first time to run a 5k.” Dara Cunningham and Nadia Serna, education juniors, said they ran for extra-credit, a free breakfast and a free T-shirt. 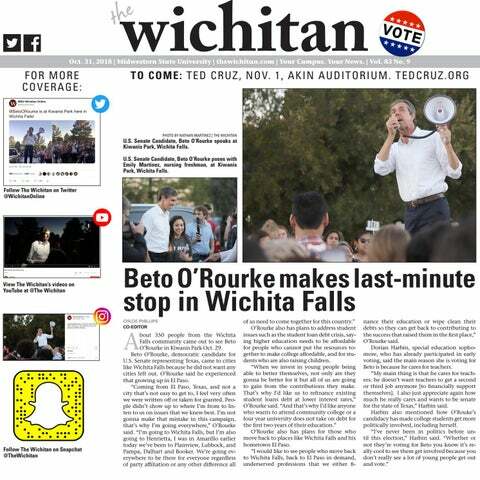 The October 31, 2018 issue of The Wichitan, the student newspaper at Midwestern State University in Wichita Falls, Texas.